Welcome to week #39 of #thesatsesh and this week I’ve been indulging in the moments of joy – seriously, the world was bombarding me with utter rubbish and bad luck and so I dug extra deep and even when my son was in AnE I looked for the joy and to be honest with you, its not that hard to find when you choose to look. Check my IG feed @fridgesays for the delights the week held for me. So it will therefore be no surprise that this weeks featured blogger’s post is also full of joy. This week This Mum Rocks wrote an awesome post with a motivational playlist just for Mummies (although I’m sure Dads and non child bearing people could also listen) and I loved it! Who doesn’t like a bit of Beyonce, Demi or Avril 😉 Music makes me happy, I listen to it at every opportunity and recently having been sharing my song of the day on my personal Facebook page. 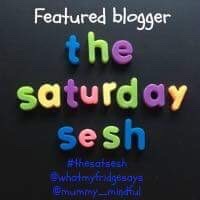 Claire is a fabulous writer and I really like the vibe her site This MuM Rocks has, its upbeat, honest and even the pictures make you feel carefree. Please give her site some love and don’t tell her that this Mummy hasn’t got around to watching The Greatest Showman yet (eek). This week if you’re joining us please make sure you comment and spread the love for our #thesatesh community, I hate it when people don’t get the comments they deserve and they are writing on yours. Check out the rules for a refresh (below) and see Hayleys site for her featured blogger.